On November 1, Russian President Vladimir Putin visited Iran for the first time since 2015. In a meeting with Supreme Leader Ayatollah Ali Khamenei, Putin voiced support for the nuclear deal and said that Russia objects to “any uniliteral change” to it. “We oppose linking Iran’s nuclear program with other issues including defensive issues.” President Donald Trump has criticized the agreement for not curtailing Iran’s ballistic missile program, which Iranian leaders have argued is defensive in nature. Khamenei told Putin that enhanced Iran-Russia cooperation could help to isolate America and decrease its influence in the region. He proposed using national currencies in bilateral transactions to “nullify” the effect of U.S. sanctions. Putin and Iranian leaders also discussed Iran-Russia cooperation in supporting President Bashar al Assad in the Syria conflict. Putin said that the fight against terrorists there was going well. The visit was timed to coincide with trilateral talks between Russia, Iran and Azerbaijan, primarily focused on improving road and rail connections between the Caspian Sea nations. Iran and Russia agreed to collaborate on “strategic” energy deals that would involve up to $30 billion in investments. Russia is eager to develop Iranian oil and gas fields. The following is a rundown of Putin’s visit. President Putin and Supreme Leader Khamenei met for about an hour and fifteen minutes. They discussed a wide range of issues, including the conflict in Syria, the nuclear deal, economic cooperation and more. The following are excerpted remarks by the leaders. "We must take advantage of useful experiences, during recent years, on regional issues and mutual relations to consolidate and develop our ties." "The failure of the American alliance in support of terrorists in Syria is an undeniable fact, but they are still engaged in plotting and conspiracy. Thus, the full resolution of the Syrian issue needs sustained, firm cooperation." Tehran & Moscow's proper resistance against terrorists' corruption in #Syria is very meaningful & has made Russia influential in West Asia. All issues & solutions on Syrian govt. should emerge from inside #Syria, & Syrian govt. should not be pressured [from outside] at all. "The Americans seek to interfere in all issues of the region and the world and to do so, they rely on weak authorities in other countries." "They [Saudi Arabia] do not even allow medicine and aid to reach the oppressed Yemeni people, whom are plagued with deadly illnesses." That's why one can talk, logically cooperate w/ Russia, as a major power, on great works which demand resolution, efforts. "We have achieved great results by our joint cooperation in Syria, and while the fight against terrorism should continue, a proper political process should be implemented in Syria." "We are opposed to any unilateral change in the provisions of this multilateral agreement, and we consider unilateralism as a violation of the international law and system." "We consider changing the core principles of the IAEA as inappropriate, and we disagree with linking Iran's nuclear program to other issues, including defense capabilities." "The United States wants to interfere in all matters of the world and the region; and, to achieve its goal, if necessary, it even ignores the interests of its allies." "I did not think, at all, that at this level of international relations, such behavior would arise, but now we are accustomed to this kind of American behavior." "Some Russian producers and traders pray that the US sanctions wouldn’t end because as a result of them, their capacities have started to attract attention." "From 2014, i.e. the start of U.S. sanctions, we devoted our funds to scientific and technological progress, and we had significant growth in the fields of biotechnology, IT, agriculture and space industries. Now, in spite of the initial concerns, we have realized that we can do whatever we decide to." "We will adhere to our principled positions, and when we start work with anyone, we will continue until the very end." 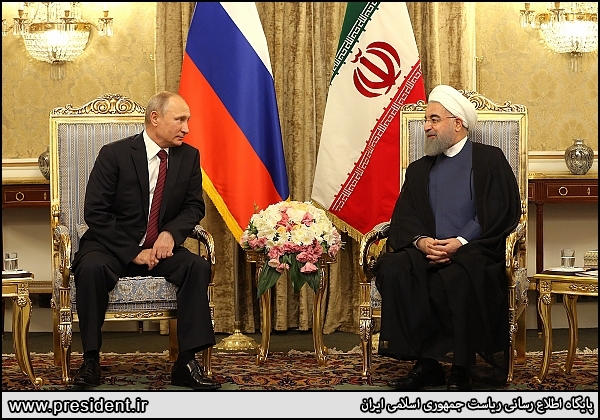 Rouhani’s meeting with Putin largely focused on boosting economic ties and security cooperation in Syria. The following are excerpted remarks. "We have many common interests for developing our relations and cooperation." The presidents of Iran, Russia and Azerbaijan discussed ways to improve cooperation in a wide range of fields, including trade, transportation and security. The following is the joint statement signed by the three leaders with excerpted remarks Putin, Rouhani and Azerbaijani President Ilham Aliyev. I sincerely thank you for accepting my invitation to attend this important meeting and welcome you to the Islamic Republic of Iran. Today, for the second time, we had this opportunity to hold a tripartite summit of presidents of Iran, Russia and Azerbaijan in Tehran. I am confident that today's meeting will be an important step in developing cooperation between the three countries, which has been developed more in recent years, and will create a clear vision for further consolidation and deepening of relations. From our point of view, holding the first tripartite summit of the Islamic Republic of Iran, the Russian Federation and the Republic of Azerbaijan in Baku and the firm determination of the heads of the three countries to hold the second round of the summit in Tehran, as a positive and valuable initiative, is an important opportunity to express views and pursue relations within the framework of common interests. The development of comprehensive and sustainable relations with neighbouring countries is one of the most important priorities of the Islamic Republic of Iran's foreign policy. On the other hand, the Iranian economy, with its one-trillion-dollar growth potential over the next 20 years, can be one of the most promising emerging economies in the world. Therefore, widespread interaction with the world, especially with neighbouring countries, is our strategic policy for the realisation of growth, and in this framework, we welcome any ideas and mechanisms that will strengthen relations with the Russian Federation and the Republic of Azerbaijan. The Islamic Republic of Iran is prepared to deepen trilateral cooperation in various fields through interaction with the Russian Federation and the Republic of Azerbaijan. Historical ties and bonds along with cultural affiliations, natural and underground resources, geographic location, common approaches and political will in the leaders of the three countries have provide important areas for development of bilateral and trilateral relations between the Islamic Republic of Iran, the Russian Federation and the Republic of Azerbaijan. Relations between Tehran and Moscow over the past years have had a positive trend in all areas. Cooperation and consultation of the Islamic Republic of Iran and the Russian Federation in resolving the nuclear issue of Iran, the implementation of the Joint Comprehensive Plan of Action (JCPOA) and continuation of peaceful nuclear cooperation, the fight against terrorism, the confrontation and management of the Syrian crisis, and the creation of the necessary conditions for the development of trade relations, including signing of several documents, such as the agreement for visa facilitation, customs cooperation, investment and cooperation in energy, transport, science and technology, has deepened the relations between the two sides and created a positive outlook for relations. In recent years, Tehran and Baku have also taken good steps to develop relations, relying on being neighbours, mutual respect and mutual interests. The signing of the customs agreement, the electricity sale agreement, the agreement on connecting railway lines of the two countries, the construction of rail bridge on the border between the two sides are among the areas for development of trade and economic relations. Tehran has always called for the end of the Karabakh dispute in the region to resolve this issue by relying on mutual talks and diplomatic and peaceful solutions, and considers the recent meeting of Azerbaijani and Armenian leaders a positive step that can create stability and security. From the point of view of the Islamic Republic of Iran, the tripartite interaction of Iran, Russia and Azerbaijan, beyond bilateral relations and in the form of a tripartite format, can not only develop and strengthen existing capacities between the three countries in various political, security, cultural and economic fields, but also by creating convergence, it can provide new opportunities to address the challenges of the region. It is obvious that such arrangements are not against any country or a third party and should be taken advantage of through a win-win approach. The Caspian Sea is the focal point for cooperation between the three countries and the place for the interests and convergence of our nations. This sea, which has brought us more solidarity, has rich oil, gas and water reserves and is a wealth of resources for all of us. The Caspian Sea is a sea of ​​peace and cooperation, and it should remain to have this function. The promotion of environmental cooperation in the Caspian Sea region is a common task and duty of all littoral states. We believe that while continuing the development of existing cooperation between the parties and the necessity of implementing the previous agreements, especially the achievements of the first meeting in Baku, the three countries can cooperate in areas such as transportation and road, rail and maritime transit, developing the "North-South Corridor", customs cooperation, cooperation in the extraction, transfer and trading of oil and gas resources, coordination in the global energy market, cooperation in the construction of infrastructure, as well as trade in other energy resources, including joining the electricity network of the three countries to each other, cooperation in the peaceful uses of nuclear energy, development of scientific and academic cooperation, technical cooperation, environmental cooperation, cooperation in banking interactions, and the use of national currencies. In this regard, it is necessary to set up and draft legal and political mechanisms for the promotion and implementation of this cooperation. The development of tripartite negotiations between the ministers of foreign affairs, taking advantage of the capacity of parliamentary diplomacy and coordination at international parliamentary meetings, cooperation and consultation in international institutions, and holding of tripartite summits of Iranian, Russian and Azerbaijani security officials to discuss common threats are among the necessary arrangements for development of political relations between the three countries. Faced with theoretical developments, especially in the two areas of unilateralism and extreme nationalism, the international community is increasingly concerned about the growth of these thoughts and its presence in international decision-making. The nationalist interpretation of international understandings and agreements, and making global developments power-centred creates the greatest dangers in the field of relations between countries. Exiting agreements and multilateral commitments and the extreme emphasis on power-centred unilateralism will set a dark future ahead of us. If this trend is to dominate the world, then it will not be possible to overcome violations of commitments, because in the current situation in the region and the world, for reasons such as the complexity of the security threats and the transboundary nature of these threats, as well as the capacity of regional integration in the development of peace and improving the level of security, development and prosperity, the cooperation of governments is inevitable, and the Islamic Republic of Iran, while believing in the necessity of interaction and cooperation between states, is seeking its interests in cooperation with others, especially with neighbouring countries and friends. In addition to the need to take advantage of existing opportunities, holding such meetings and deepening the relations of the three countries can play an important role in dealing with common threats. We believe that complexity and transnational threats necessitate cooperation of governments to deal with them, and the recent developments in the region and the world are witness to the claim that through cooperation, interaction and understanding of mutual interests, it is possible to overcome many of the threats and challenges. In the current era, challenges such as terrorism and extremism, destructive intervention of trans-national powers in the internal affairs of other countries, the political use of sanctioning instruments aimed at promoting illegitimate political goals, environmental problems, drug trafficking and the spread of transnational and cybercrime are among the common threats, for which cooperation and consultation of governments is the only way to manage and control. The Islamic Republic of Iran welcomes deepening of cooperation with the Russian Federation and the Republic of Azerbaijan in facing these challenges. For the Islamic Republic of Iran, promoting security in the region is important in cooperation with other partners and in the fight against terrorist groups. It is also among our principles to emphasise political solutions to resolve various crises. This approach was considered in cooperation with the Russian government in facing with the Syrian crisis and we have been working to help establish peace and eliminate tensions in Syria through continuation of the Astana talks. Also regarding the Iraqi issue, preserving territorial integrity and unity of the country and cooperation with its central government in the process of combatting terrorism are considered vital for us and we believe that coordination of other actors in this regard will be very important, because the lack of cooperation in these areas can have devastating consequences for all countries in the region. In the end, I would like to thank the honourable Presidents and their delegations. I am confident that holding of this meeting will have an effective role in promoting regional cooperation and strengthening regional peace. Russia’s state oil company, Rosneft, and the National Iranian Oil Company signed a roadmap agreement on implementing “strategic” projects in Iran with total investments worth up to $30 billion, according to Rosneft head Igor Sechin. The output from the joint projects was projected to plateau at 55 million tons per year or 1.1 million barrels per day. Details on how the investments would be split between the two companies were not disclosed.